Art Glass Bowls by Internationall Famous Glass Artists in a Variety of Styles and Colors, artist signed. There are over 95 bowls on our site with more being added all the time. Explore these pages to see our entire collection or visit each artist to see their speciality. These are Contemporary Glass Bowls from around the world. Glass Artist Bryon Sutherland's Amazon Bowl. A high gloss cobalt blue interior and a bright yellow lip highlight this spectacular glass bowl. Exterior colors of blue and green form a pattern that is darker at the center and lighter as it moves towards the outer rim. 14" x 14" x 10.50" and 8"high. Signed Sutherland Glass Art Bryon Sutherland and dated. Rick Strini Aquarium Bowl, with tropical influences, his most popular color combination and shape. Characterized by milifiori and random lines as if under water, the blues and yellows cast a definite oceanic influence and perspective. Shown with ruby lip. Approx. 14.5" dia. and 7.5" h.
GlassMasters Danielle Gartner and Stephen Blade's Ruby Batik Covered Bowl with Avain Finial from their Batik Series. Inspired by their fascination with geological formations. Available in small and large size. Artist signed. Christie Moody, "Beween the Notes" fused glass tango and salsa dance art. Inspired by her passion for dance. The vibrant dicroic images move off the plates or wait with tension for their next step. Diamond engraved and hot worked details abound. 21" l x 9"d.
Artist Bryan Goldenberg, Slow Burn Glass, Martini Shaped Bowl. 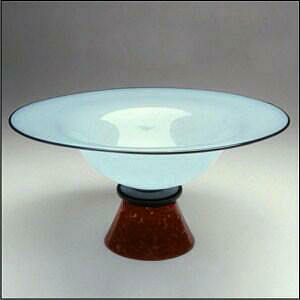 The mix of blue, white, and red make up this nice martini shaped bowl. Available in large size. Topped with a beautiful gold rim. Comes artist signed. Approximately 10"w x 5"h.
David Lotton Clematis Reflection Bowl. Hand blown with colorful purple/pink flowers. Artist signed, approximately 4.75"h x 4.75"w, 5.0 lbs. Christie Moody, Cockatiel bowl. Created with fused and slumped glass. It is undulating and flowing, and embellished with hand pulled glass canes. Approximately 14" diameter. GlassMasters Danielle Gartner and Stephen Blade's Covered Puffy Jar Ruby with Ball Finial from their Strata Series. Inspired by their fascination with geological formations. Available in small and large size and can be ordered in black. Artist signed and dated. 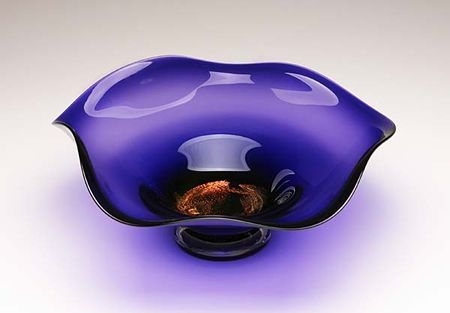 GlassMasters Janet and Rick Nicholson Dichroic Series Amethyst Open Bowl. 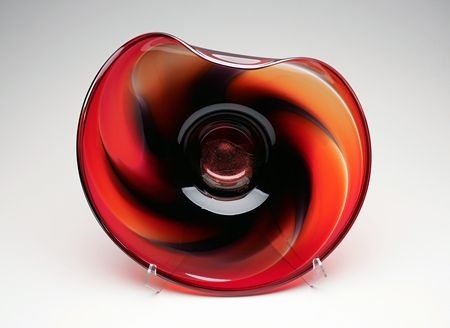 It is artist signed and dated and approximately 14.0" w.
GlassMasters Janet & Rick Nicholson's Dichroic Series Wave Bowl in red/black. It is artist signed and dated...approximately 23.0"w.
Christie Moody Double Wave Bowl. These undulating fused and slumped glass centerpieces are like small vignettes from the ocean or lake. Approx. 16"w x 12" h.
Rick Strini Florentine Bowls represent the "gold Luster", ruby interiors and decorations with a black ebony accent. Highly sought after by collectors the luster was almost lost after the demise of Tiffany Glass and Fredrick Carder. Approx. 14.5" dia. 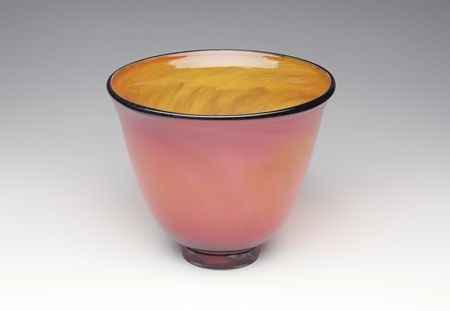 and 7.5" h.
Artist Bryan Goldenberg, Alabaster Red Martini Bowl with Gold Foot and clear solid ball. 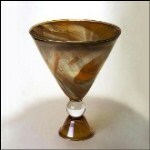 Created with three gathers of glass, Bryan uses his tools like a paint brush to swirl the glass. Signature style developed in his15 years of glass making. 20" dia. x 18"h.
Christie Moody Frog Coral Wave Vase. An elegant centerpieces featuring cute frogs in colorful kelp like leaves, she meticulously re-creates. Approximately 9" x 14"
Glass Artist Bryon Sutherland's Frog Skin Clam Shell. A semi-closed shell with yellow swirls in the interior. Rim outlined with a cobalt and light blue lip enhancing entire design. Exterior colors created to give the appearence of frog skin. 14.75" x 14.50" x 13.0" and 8.25"high. Signed Sutherland Glass Art Bryon Sutherland & dated. Christie Moody, Green Heron bowl. Created with fused and slumped glass. It is undulating and flowing, and embellished with hand pulled glass canes. Approximately 11" diameter. 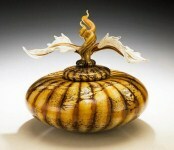 Artist Bryan Goldenberg, Slow Burn Glass, Heart Bowl. A choice of orange, fuchsia and lavender. Great serving piece or use for display. Also available in large size. Comes artist signed, approximately 9"w x 9"d x 3"h.
Christie Moody, Heron Fishing Tapered bowl. Created with fused and slumped glass. It is undulating and flowing, and embellished with hand pulled glass canes. Approx. 15" dia. Christie Moody, Hot Rooster Bowl. Colorful creation with fused and slumped glass. Undulating and flowing with colorful hand pulled glass canes. Artist signed, 9" dia. 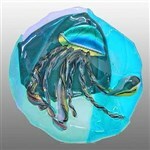 Christie Moody, Jellyfish bowl. Created with fused and slumped glass. Undulating and flowing, is the description of this Jellyfish. Embellished with hand pulled glass canes. 9" d.
Christie Moody, Japanese Koi Fish bowl. Created with fused and slumped glass. It is undulating and flowing, and embellished with hand pulled glass canes. Approx. 11" dia. Artist Bryan Goldenberg, Slow Burn Glass, Large Bowl from his marble series. 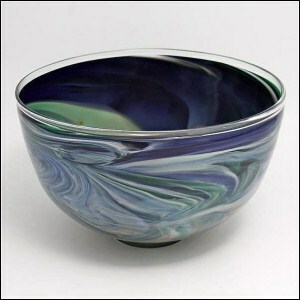 The mix of blue, green and white make up this striking colored bowl. Comes artist signed. Approximately 18"w x 8"h.
Artist Bryan Goldenberg, Slow Burn Glass, Large Bowl from his marble series. 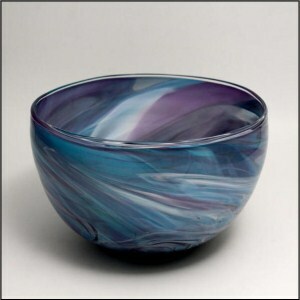 The mix of blue, purple and white make up this striking colored bowl. Comes artist signed. Approximately 18"w x 8"h.
Artist Bryan Goldenberg, Slow Burn Glass, Large Bowl from his marble series. 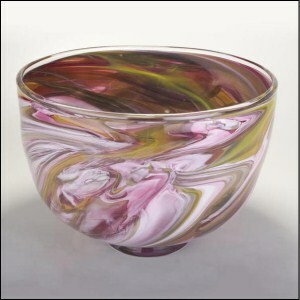 The mix of pink and yellow and white make up this striking colored bowl. Comes artist signed. 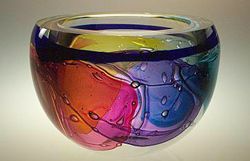 Approximately 18"w x 8"h.
GlassMaster Leon Applebaum's radiant "Lava Bowl" is his classic "sunshine" bowl, with five brillant colors, hyacynth, marine blue, teal, gold ruby and gold. These colors fill the surrounded smooth crystal and create dynamically balanced visual harmony. Approximately 10.0"w x 7.0"h.
Glass Artist Bryon Sutherland's Marlyn Clam Shell. Open shell w/light shades of violet getting progressively darker at center. Rim outlined w/red lip that enhances entire design. Exterior colors reminescent of the sea, shades of blues and green. Ripple effect on exterior surface gives wave like appearence. 15.0" x 15.25" x 12.0" and 8.5"high. Signed Sutherland Glass Art and dated. Christie Moody, Merlady Oceanic Oval bowl. Created with fused and slumped glass. It is undulating and flowing, and embellished with colorful hand pulled glass canes. Approx. 9" diameter. Christie Moody, Moon Light Heron bowl. Created with fused and slumped glass. It is undulating and flowing, and embellished with hand pulled glass canes. Approx. 15" dia. Artist Bryan Goldenberg, Slow Burn Glass, Nautical Blue Footed Bowl. Striking marbleized color design, fused to clear marble ball attached to reverse, cone shaped chestnut brown foot. Topped with a beautiful gold rim. Comes artist signed. Approximately 28"high x 12"diameter, at the top. Pedestal approximately 7" diameter. 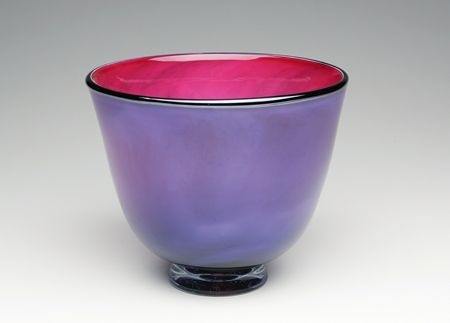 GlassMasters Janet & Rick Nicholson's Overlay Series in amethyst/ruby - dichroic lip. It is artist signed & dated...approximately 8.0"h x 10.0"w x 10.0"d. This series is available in sizes up to 12.0"h. Call for pricing. 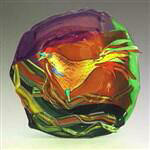 GlassMasters Janet & Rick Nicholson's Overlay Series I in gold topaz/ruby - dichroic lip. It is artist signed and dated...approximately 8.0"h x 10.0"w x 10.0"d. This series is available in sizes up to 12.0"h. Call for pricing. Christie Moody, Owl in Bowl. Created with fused and slumped glass. Striking colors, sharp detail and embellished with hand pulled glass canes. 9" diameter. Christie Moody, colorful fused Glass Oyster Catcher square plate. Colorful, perfect for display or table top, created with fused and dicroic glass. Approximately 10" square.